In general terms, the Romans coined the name 'Gaul' to describe the Celtic tribes of what is now central, northern and eastern France. The Gauls were divided from the Belgae to the north by the Marne and the Seine, and from the Aquitani to the south by the River Garonne, and they also extended into Switzerland, northern Italy, and along the Danube. By the middle of the first century BC, the Latobrigi were a minor confederation that was located in the crook formed by the Rhine exiting Lake Constance and turning northwards. They were neighboured to the north and possibly the east by the Germanic Tulingi, across the upper reaches of the Rhine to the south by the Raurici and Helvetii, and to the west by the Triboci (another Germanic tribe), and farther on by the Lingones. The confederation should not be confused with the Latovici to the south of the Danube. Their origins are uncertain but it seems more than coincidental that there was another tribe of the same name which seems to have travelled from north of the Danube to find a homeland. This tribe of Latobrigi may well have had the same origins, possibly as part of the Norici before they crossed the Danube. If so then they seem to bear a Germanic element which would mark them out as possible Belgae rather than Gauls. The tribe's name is a rather confusing one to break down, with far too many possibilities available. Proto-Celtic has *lat-, meaning 'day', or *latākā-, *latjo-, meaning 'mud', or *lati-, meaning 'liquor', or even *lāto-, meaning 'lust' - take your pick. The second part, 'brig', is a fort and 'vic' is a fight, while 'wik' in proto-Celtic means 'village'. Perhaps the tribe were the Latovici and their town was Latobrigi, although none of the options for 'lato' really makes much sense. However, 'wik' has alternatives available, including *wīk-ā- (? ), meaning 'fight', *wik-ari- (? ), meaning 'fierce', *wik-e/o-, again meaning 'fight', or the aforementioned *wīko-, *wīku-, meaning 'village'. A literal interpretation of 'lust fort' ('lato-brigi') brings to mind 'Roaring Camp', but a more hilarious approach would be to assume that some tribal leader was particularly well known as a cocksman and was given the nickname Latos, meaning lust, along the same lines as Morgan the Goat in the film, The Man Who Went Up A Hill And Came Down A Mountain. If that interpretation is too irreverent, perhaps 'the day fort [people] of the 'day bridge' is preferable. As that explanation is pretty unsatisfactory, a leap would be to suggest that the proto-Celtic word list is missing something. In modern Welsh the 'L' would have doubled and the 't' softened to a 'dd' (which is voiced as a 'th'), all of which provides the much more satisfying 'lladd' [lladd-; 3.s. & 2.s.imp. lladd] (v.), meaning 'kill, slay, slaughter; cut'. This would provide 'the fighting killers', which is pretty fierce... if not as much fun as 'lust fort'. Julius Caesar stated that the Celts who lived nearest the Rhine waged continual war against the German tribes on the other side. Charles Athanase Walckenaer (in his work in three volumes, Géographie ancienne, historique et comparée des Gaules, 1839, with a new edition in 1862) considered it certain that the Tulingi were in the district of Thiengen and Stühlingen in Baden, and the Latobrigi were based around the Donaueschingen area, where the Briggach and the Bregge join the Danube. This opinion is founded on the resemblance of names, and on the fact that these two tribes must have been east of the Rhine. Bruyge, a small place on the Bregge, and of course the Bregge itself both seem to bear the tribe's name. The shattered remnants of the Helvetii and their allies are forced back to their homeland, but having been greatly reduced, they will be unable to fight off Germanic incursions that could also threaten Gaul. Julius Caesar allows the relatively hospitable Boii to settle a buffer zone to the north of the Helvetii and east of the Aeduii, but even this shift leaves gaps for Germanic incursions, and one such incursion is already underway to the north. Caesar receives a federation of chiefs from tribes that include the Sequani, all of whom are suffering thanks to the Suebic invasion under Ariovistus. It is this campaign and its mixed outcome, despite victory in battle, that triggers Julius Caesar's campaigns in Gaul from this point onwards, which result in the eventual annexation of the entire land into the Roman state. Following that, the history of Gaul's population of Celts is tied to that of the empire. Augustus determines that the Alpine tribes need to be pacified in order to end their warlike behaviour, alternately attacking or extracting money from Romans who pass through the region, even when they have armies in tow. He wages a steady, determined campaign against them, and in a period of ten years he 'pacifies the Alps all the way from the Adriatic to the Tyrrhenian seas' (written by Augustus himself). The Brigantii and their immediate neighbours are defeated by 15 BC, although whether or not this includes the Latobrigi is unclear. 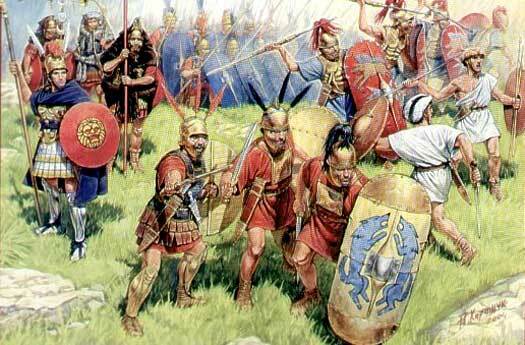 It is just as possible that they had been subdued by the Roman victory in Gaul in the 50s BC. Emperor Augustus creates the province of Alpes Maritimae (the maritime, or seaward, Alps). It has its capital at Cemenelum (modern Nice, although this is switched in 297 to Civitas Ebrodunensium, modern Embrun).